People questioned why Maine Mendoza won the ‘Best Supporting Actress’ award for “My Bebe Love” in the recent MMFF 2015 awards night. Iza Calzado, who was nominated in the category, was asked by netizens on how she felt about it. On Twitter, the actress posted her message to end the story. Just opened my Twitter account to find lots of senseless bashing about the awards. I have not seen a single film, not even haunted mansion. Iza Calzado spoke up over the recent MMFF issue especially on what happened to “Honor Thy Father” movie. People reacted about the disqualification of the movie from “Best Picture award category. On a message posted on Twitter, the actress felt sad over the news. She is hoping that the next leaders will support Philippine movies like what other foreign countries do. Iza was one of the stars of “Haunted Mansion”, one of the official MMFF movie entries this 2015. Iza was one of the star of “Haunted Mansion”, one of the official MMFF movie entries this 2015. Get well soon Clau, we really love to see you soon on Monday in Cebu for the Etiquette tour. 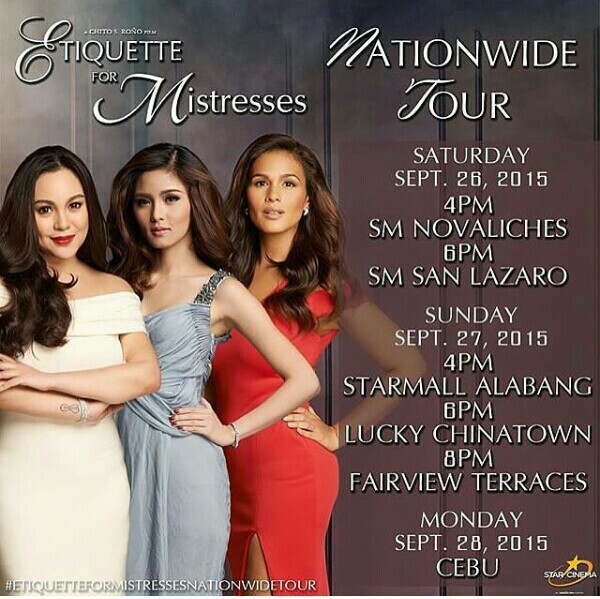 Kim Chiu and Iza Calsado will also be around, so can’t wait. Kris Aquino won’t be around as she needs bed rest. While Cheena Crab has to go back to the US.